Sardines, or pilchards, are common names used to refer to various small, oily fish. The term sardine was first used in English during the early 15th century and may come from the Mediterranean island of Sardinia, around which sardines were once abundant. The terms sardine and pilchard are not precise, and what is meant depends on the region. The United Kingdom's Sea Fish Industry Authority, for example, classifies sardines as young pilchards. One criterion suggests fish shorter in length than 6 inches are sardines, and larger ones pilchards. Sardines are commonly consumed by humans. Fresh sardines are often grilled, pickled or smoked, or preserved in cans. 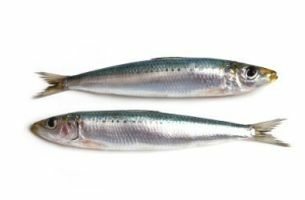 Because they are low in the food chain sardines are very low in contaminants such as mercury, relative to other fish commonly eaten by humans.